Sure it's fun to bulk, but that extra layer of body fat will have to come off at some point. Do yourself a favor and read this guide to ensure maximum muscle gains with minimal fat gains. Let's be honest: For a lot of people, an offseason diet plan is usually nothing more than an all-you-can-eat "bulking" period. Sure, on one hand, the additional calories lend themselves well to increased muscle and strong performances in the gym. But on the other hand, too much of a good thing is not always good. Excessive intake will certainly be associated with an increase in body fat. When trying to pack on quality weight, a small increase in body fat is to be expected. However, the weekend binges and alcohol benders are fueling fat gain rather than muscle gain. If you're a physique athlete or someone who likes to have a summer six-pack, those pounds must eventually come off. Heck, most people strive for a leaner appearance at some point. Why set yourself up for an even tougher challenge down the road? As a competitor, I honestly don't see a point in making my prep season more difficult than it already is. Why add an excessive amount of body fat when you'll ultimately have to work that much harder to shed it? If you want to achieve your strongest leanest, offseason yet, then look no further. I want you to enjoy the extra calories, but not at the expense of too much extra body fat. Instead of walking offstage and heading directly into an ice cream parlor, start with a controlled, gradual increase in your daily caloric intake. Adding a small number of calories to your food intake each week will allow your metabolism to gradually adapt to the higher intake, lessening the chance of fat storage. If done correctly, with patience and persistence, these slight adjustments will add up quickly, providing you with ample room to fit in all of your favorite treats in moderation. Yes, you will have plenty of room for the occasional Pop-Tart or ice cream sandwich. Be careful not to drag this process out too slowly, or your hunger levels may surpass your macros in a flash. Strive to take moderate jumps in intake initially, until you comfortably reach maintenance. For example, rather than increasing intake by only 25-50 calories each week, consider boosting by 100-150. This will help to reduce excessive hunger while preserving your lean frame. As your calorie goals increase consistently, it's important to keep both your personal goals and the role of each macronutrient in mind. All food provides energy to your body, but protein, carbs, and fat each affect your body differently. For example, protein raises your metabolic rate and reduces hunger more effectively than the same amount of fat or carbohydrates. And while carbohydrates will help to fuel strong performance in the gym, you won't maximize your muscle-building potential without the appropriate amount of protein. Although protein is important, it's essential to know that carbs and fat are vital in supporting a healthy diet. However, figuring out how many grams of carbs and fat to have can be slightly more complex than figuring out how many grams of protein to have. A great starting place for protein is to aim for one gram per pound of body weight. Carbohydrate and fat goals are highly individualized, as some people feel better with a high-carbohydrate, low-fat approach, while others prefer the opposite. Find the right balance that supports your goals, performance, and taste preferences. The goal here is to figure out which combination of protein, carbs, and fats will work best for you, and what types of food you like to eat. While you increase your calories, carbs should be the main variable to manipulate. The goal here is to figure out which combination of protein, carbs, and fats will work best for you, and what types of food you like to eat. Slowly work up adding about 25-38 grams of carbs (100-150 calories) to your food intake per week. As you do so, pay attention to more than just the bathroom scale. Assess body measurements and progress pictures to view the complete picture. If you notice your weight skyrocket after an adjustment, hold the same macros for the next week, until your weight maintains or even dips. This approach can maximize muscle gains and minimize fat storage. Protein can stay consistent at one gram per pound of body weight. However, distribute your intake proportionally throughout the day, with emphasis on pre-workout and post-workout protein consumption. Fats can be adjusted to fill in the remainder of your calories. However, if you follow a higher-fat, lower-carbohydrate diet plan, feel free to increase your fat intake along the same lines as you do your carb intake. Remember that one gram of fat provides 9 calories, so 100-150 calories translates to 10-15 grams of fat. 24g of Protein to Help Prevent Muscle Breakdown and Provides Great Gains in Lean Muscle. Go Now! Although I think it's important for you to see a sample plan, keep in mind that every body is different; what works for me probably won't work for you. Pay attention to your physique as you slowly add in calories and make adjustments to your macros. If you continue to increase your muscle mass without adding too much extra fat, you're on the right track. Remember to factor in the scale, measurements, and progress pictures. Below is an example of my offseason meal plan for a training day. Depending on what I'm in the mood for, the meals and food sources will change. However, the macronutrient breakdown and calories will stay consistent. I like to surround my workout with the majority of my carbohydrates. From there, I'll spread the rest out to fit my meals and daily schedule. On my nontraining days, I only take in about 85 percent of the carbs that I'd eat on training days. So, my intake goes from around 300 grams to about 255. You don't want to look back on your life when you're 75, no longer ripped, and say, "Hell, I wish I'd eaten that." 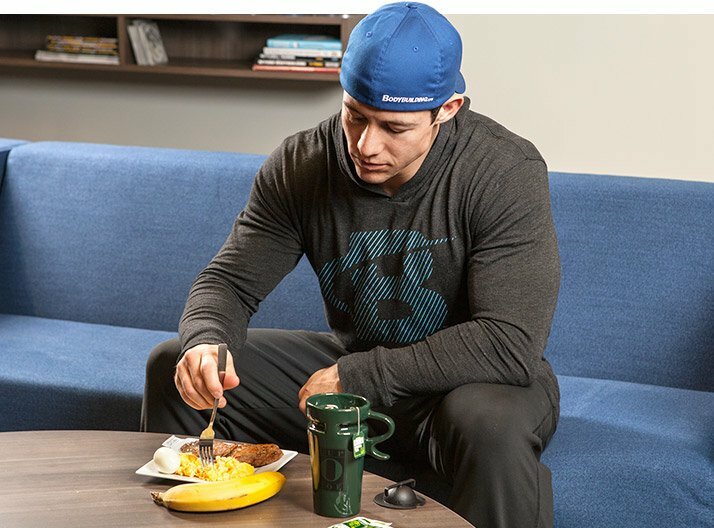 A more flexible reverse-diet approach for the offseason will enable you to enjoy the foods you want while maintaining a relatively low body-fat percentage. Stay patient, and the big gains and big meals will follow. Check out Grenade's complete supplement lineup! Go Now! 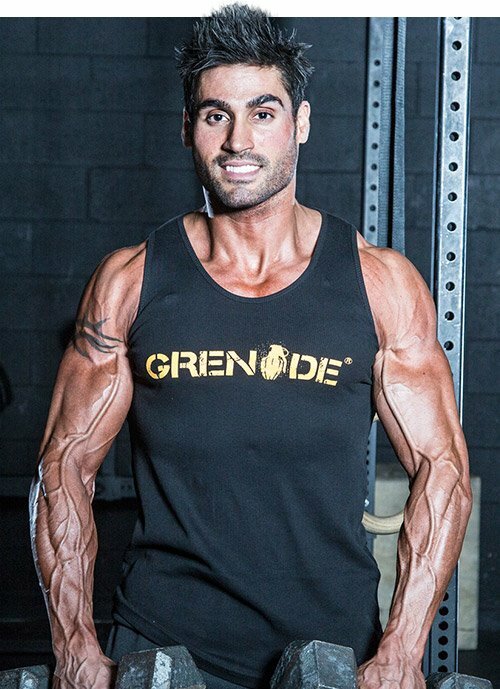 Vinny is a Team Grenade athlete, a men's physique competitor, nutritional coach, and personal trainer.